Are you a snorer or a sleep walker? Perhaps you suffer from sleep apnoea or insomnia? Could scientific research give you answers to both a cause and a cure? 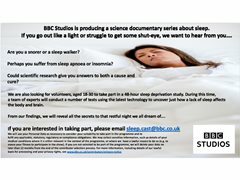 Looking for contributors for new BBC Studios science documentary about sleep. Are you a snorer or a sleep walker? Perhaps you suffer from sleep apnoea, insomnia or restless leg syndrome? Also looking for volunteers, aged 18-30 to take part in a 48-hour sleep-deprivation study.